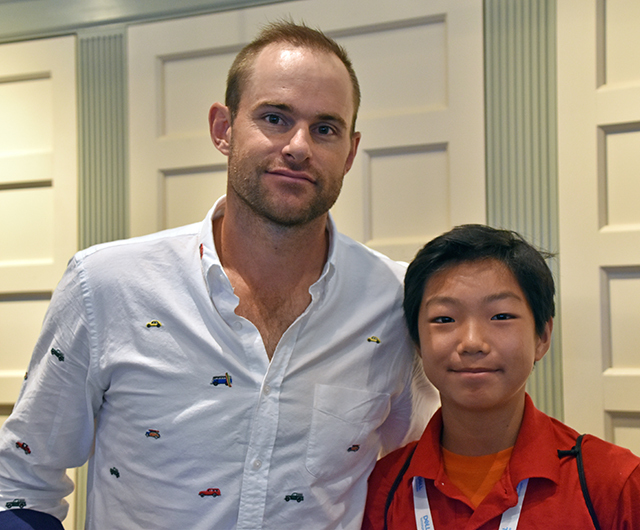 Roddick Inducted Into the Tennis Hall of Fame | Kid Reporters' Notebook | Scholastic Inc.
Stone with retired tennis great Andy Roddick at the Hall of Fame induction in Newport, Rhode Island. On July 22, thousands of tennis fans from around the world gathered in Newport, Rhode Island. They were there to witness the Class of 2017’s induction into the International Tennis Hall of Fame (ITHF). Former Grand Slam champions Kim Clijsters of Belgium and Andy Roddick of the United States were inducted, along with six-time Paralympic medalist Monique Kalkman-van den Bosch and journalist and historian Steve Flink. Tennis instructor Vic Braden, who died in 2014, was inducted posthumously. Roddick, who lives in Austin, Texas, won the U.S. Open in 2003. He retired from the game in 2012, on his 30th birthday. Being a member of the Tennis Hall of Fame Class of 2017 allows the inductees to be enshrined in tennis history. Each individual is honored with an exhibit in the ITHF museum. Now that the inductees have risen to the pinnacle of the tennis world, they are focusing on other priorities. Clijsters and her husband are raising three young children. Roddick hopes to spend more time with his son, Hank, who is not yet two. “Now my life is about changing diapers and watching PAW Patrol,” Roddick said, smiling. He and his wife are expecting their second child.